We always want to stay up to date and have a "new school" philosophy of thinking regarding detailing practices. 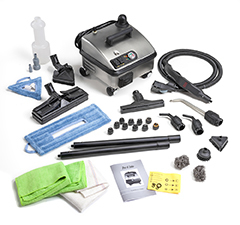 The use of dry vapor steamers to aid in cleaning the interior portion of a vehicle is something a detailer should seriously consider adding to his arsenal of equipment. Years ago, even before heated carpet extractors, details had the old "bucket and brush" method of cleaning interiors. Not only is this "old school", this is simply the wrong way to clean. Most detailers now have heated carpet extractors which are light years ahead of the "bucket and brush" method, but let's look at what a dry steam cleaner can do for detailing. Popular models used in the Industry include the Pro5, Pro6 Solo, Pro6 Duo, Desi Auto and Plus. Offering the best selection of standard accessories, quality and our prices matched by our reputation over 20+ years in the Industry. I too was not a steam fan until recently. I associated steamers with the "TV units" and found them to be cheap, ineffective, and a waste of time for car use. 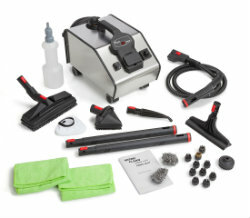 However, a proper steam cleaner, not only will perform BETTER than a carpet extractor, but has many more uses. Preferred Vapor Clean Steam steam, carpet and vaopr cleaners used for Auto Detailing include - Pro6 duo, Unilux for their durability and tools for basic detailing. Our Desiderio Plus for their injection and extraction features for those wanting the full functionality.A steam cleaner will get into areas a carpet extractor only wishes to. 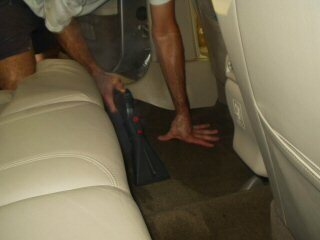 A steam cleaner can clean between seats, consoles, dashes, cup holders, vents, door pockets, door jambs, and more. A steamer WILL NOT leave an interior soaking wet the way some carpet extractors will. A major reason for mold and mildew and odors within an interior of a vehicle is because of over-wetting with an extractor. Steam dries within seconds. 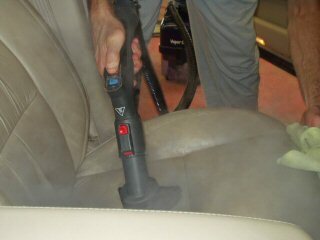 A steam cleaner will clean leather seats better than using harsh chemicals and a brush. It will leave leather soft and supple and still require less time and effort. Of course with a steam cleaner all you are using super heated water. No chemicals are needed which keeps the interior drier, saves money on those chemicals, and still leaves the inside smelling fresh, not harsh, and there will be no fear of a customer being sensitive to the chemicals, because you will not be using any! 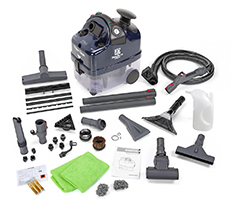 The Desiderio steam cleaner, with its vacuum unit and injection or extraction system built right in will allow you to steam and/or extract carpets and upholstery and immediately vacuum the dirt right out. You can even use it as a regular vacuum. A steam cleaner can even be used to clean windows to perfection. All the Vapor Clean steamers are built to last and out perform the competition. They are commercial grade to handle any detailing use, and built to last. There simply are none. They are the cutting edge of interior cleaning. As outlined in many areas of this website are the advantages and immense cleaning abilities of steam. 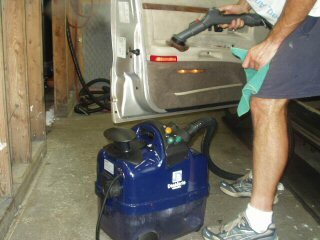 Get out of the "stone age" Don't be "old school" be on the cutting edge of detailing and start cleaning with steam! Consoles, air conditioning vents, virtually all interior surfaces begin the detailing process. Remove car seat marks easily for better resale value. Glass is sparkling clean - detailers have used only water on windows for years for best results - steam works that much better!